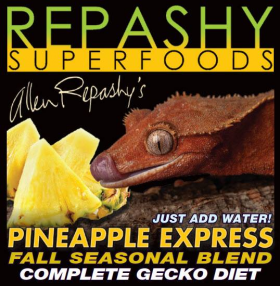 REPASHY SUPERFOODS :: Repashy Pineapple Express Gecko Diet - Seasonal Blend! Home/REPASHY SUPERFOODS/Repashy Pineapple Express Gecko Diet - Seasonal Blend! Our Limited Edition, Seasonal Blend Gecko Diet for Fruit Eating Species. Featuring Dried Pineapple Powder. INGREDIENTS: Dried Banana, Whey Protein Isolate, Pineapple Powder, Black Soldier Fly Larvae Meal, Whole Dried Egg, Dried Date, Molasses, Coconut Meal, Calcium Carbonate, Dicalcium Phosphate, Lecithin, Taurine, Dried Kelp, Dried Watermelon, Citric Acid, Salt, Calcium Propionate and Potassium Sorbate (as preservatives), Natural Flavor, Magnesium Amino Acid Chelate, Zinc Methionine Hydroxy Analogue Chelate, Manganese Methionine HydroxyAnalogue Chelate, Copper Methionine Hydroxy Analogue Chelate. Vitamins: (Vitamin A Supplement, Vitamin D3 Supplement, Calcium L-Ascorbyl-2-Monophosphate, Vitamin E Supplement, Niacin, Beta Carotene, Pantothenic Acid, Riboflavin, Pyridoxine Hydrochloride, Thiamine Mononitrate, Folic Acid, Biotin, Vitamin B-12 Supplement, Menadione Sodium Bisulfite Complex). Guaranteed Analysis: Crude Protein min. 20%, Crude Fat min. 5%, Crude Fiber max. 3%, Moisture max. 8%, Ash max. 7%, Calcium min. 1.3%. 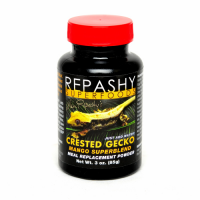 Repashy is excited and proud to introduce our second seasonal gecko blend for Fall 2018. kicked off the Fall seasonal project with a highly successful photo contest via social media that inspired hundreds of photo entries and much excitement. In the end, we put it to a public vote, and the great crested gecko photo on this new label was taken by hobbyist Stephanie King from “San Diego Cresteds”. Introducing our new Fall 2018 Seasonal Gecko Diet, “Pineapple Express”. This phrase may remind some people of a Film by the same name, or a strain of Cannabis, but it’s actually named after a weather pattern here on the West coast of North America. This atmospheric river is called the "Pineapple Express" because moisture builds up in the tropical Pacific around Hawaii and can wallop the U.S. and Canada's West Coasts with heavy rainfall and snow beginning in the Fall Season and continuing into Winter. 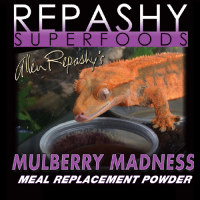 Repashy “Pineapple Express” is an incredibly tasty diet that during feeding trials, created more empty bowls with every beta tester, than any diet we have tested to date. It uses the same base formula as the first seasonal blend and huge hit “Mulberry Madness” but replaces the mulberry with pure dried pineapple fruit powder. We first included Pineapple in our Mango Superblend many years ago, but it was so expensive, we had to limit its inclusion. This year, we found a great new source, and are able to include it without limitation at desired levels, and geckos go absolutely crazy for it. Pineapple Express will be manufactured in a one-time limited production run (like all seasonal blends). It will launch to customers on September 1st 2018. We learned a good lesson from Mulberry Madness, which sold out in two weeks and forced us to do a second run to keep it in stock for our dealers and distributors for what ended up being 2 months, so we did a larger production run this first time around and shouldn’t have any inventory issues until it’s sold out. Mulberry Madness seems to be sold out or down to a very few jars already on the retail market, and those with remaining inventory, have a monopoly while their supplies last. If you enjoyed Mulberry Madness, you will love Pineapple Express….. give it a try, and stock up so you will have what you need until its available again next Fall. This season we have gone ahead and added back in the 6 oz jar size, so retail customers will have the ability to purchase 3 oz. 6 oz. and 12 oz. jars, and our Breeder/Dealers, will have access to 2kg jars for personal use (not for resale) (contact us if you would like to become a Dealer). We will immediately begin working on our Winter blend and again, run a social media contest for label photo submissions, so get snapping those photo’s and be ready to enter soon! Please support your favorite Repashy Dealer...... and order yours today!